Pastrami, Corned Beef, Montreal Smoked Meat or whatever name you are familiar with are all made from the same beast (beef) but they are hardly the same beast. 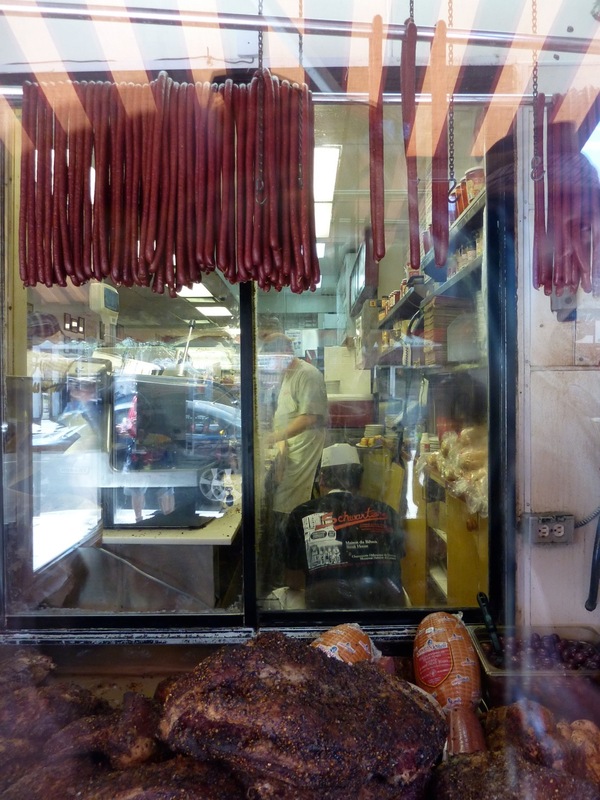 About five years ago my wife and I made the pilgrimage to Katz’s Delicatessen on East Houston in the Lower East Side. Katz’s has been in existence since 1888. According to their website their Corned Beef uses a secret “dry cure” pickling formula that requires a full month to be ready to serve. Katz’s serves Pastrami, Corned Beef and Brisket. We tried the Corned Beef and the Pastrami they were both good but the show-stopper was the pickled cucumbers. They were bright green and fresh looking and were just like eating a cucumber but pickled. I have spent hours searching the internet for comments about these pickles but it would seem that only my wife and I have rally noticed them. So if you have the recipe I will trade you some Smoked Meat. 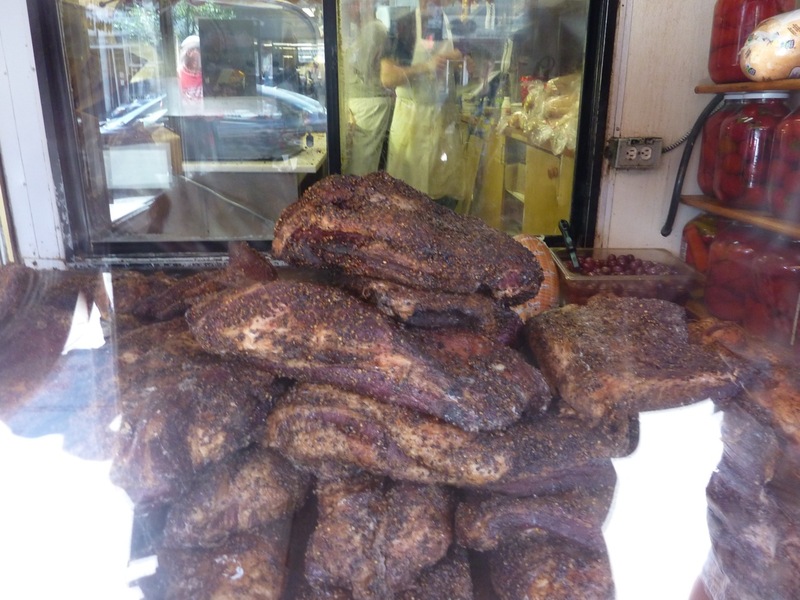 After that trip, there was a dry spell with only the occasional taste of Swartz’s from Montreal whenever Jonathan, one of my wine mentors would have a hankering for Montreal Smoked Meat and have a brisket flown in from Montreal. 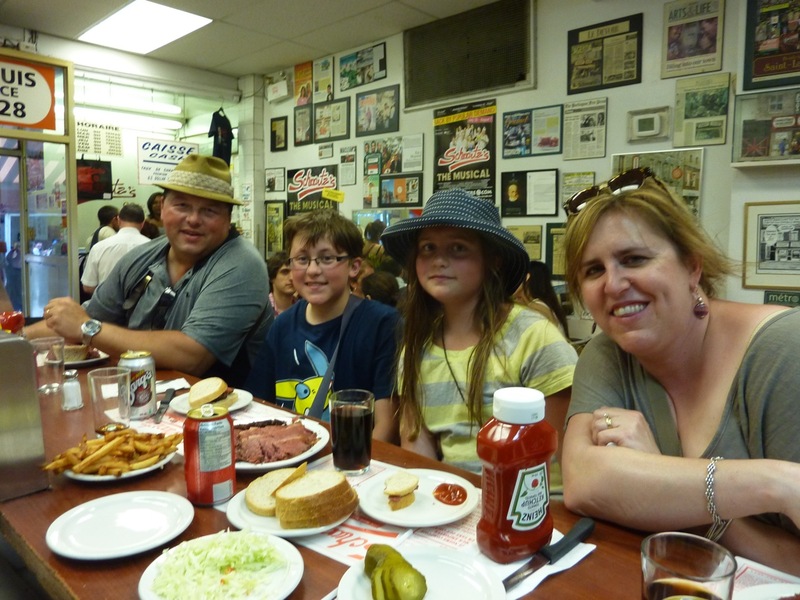 On a family vacation to Montreal a year ago we made the pilgrimage to Swartz’s to sample some of that delectable smoked meat straight from their steamer. The kids had always sort of turned their nose up at previous suggestions of smoked meat back home but I think a day of riding the BIXI bike system had worked up their appetites (that and standing in line for a half hour in the sun on a plus 30 deg C day). The whole family dug in and we soon made quick work of the mounds of steaming meat in front of us. Looking at these photos now, I have to say my brisket was much more photogenic at that stage! When we got home from the trip the whole family soon began craving more. I discovered the boxes of vacuum packed smoked meat from Dunn’s in the COSTCO coolers and from then on whenever we had a hankering for smoked meat we knew where the quick fix could be found. It was good but not quite the same. Now that I had a smoker and had dabbled in a bit of meat curing alongside my cheese making over the last couple of years I thought it was time to go for the gusto and make my own Montreal Smoked Meat – Sailor Rick Style. Once I had decided to jump in and make ‘Montreal Smoked Meat’, I thought I had better get it right the first time cause it ain’t cheap. A full packer brisket runs about $55.00 and then you need Cure #1, Pepper Corns and Coriander Seeds by the pound and a few other spices. Running the smoker is another cost at about $8.00 for pellets. All in it will run you about $80 dollars to finish a 13 pound brisket. 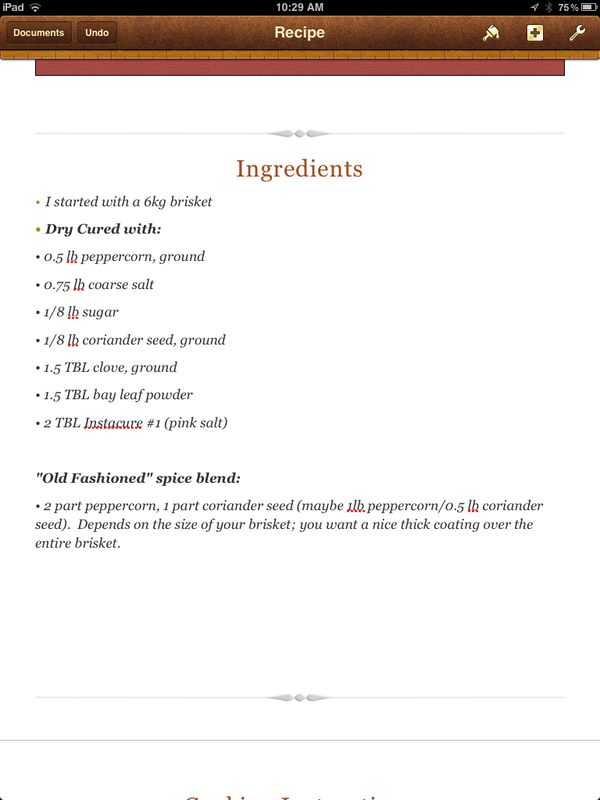 After reading my personal charcuterie library (Charcuterie and Cured) and reviewing some of the on-line smoking websites I discovered a recipe on Chowhound where there was a lengthy multi year discussion of how to make proper Montreal Smoked Meat. ‘Porker’ swore his recipe was as good as Swartz’s and a number of others agreed. He also mentioned it was not his own recipe but that he couldn’t remember where he got it. 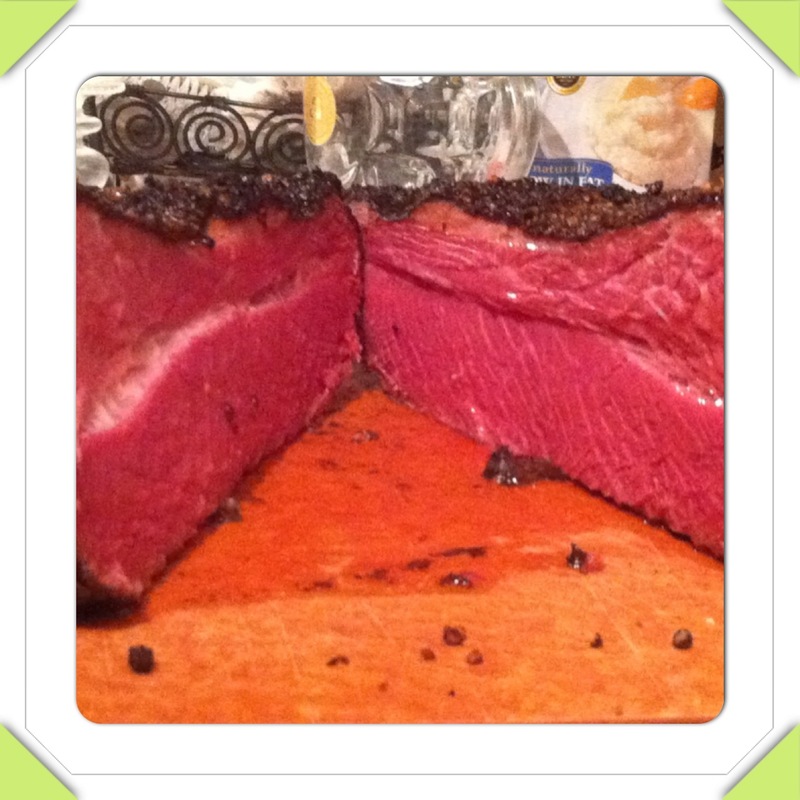 Through these posts I found an experiment by Chef Fowke in Vancouver called “The Great Pastrami & Smoked Meat Experiment”. 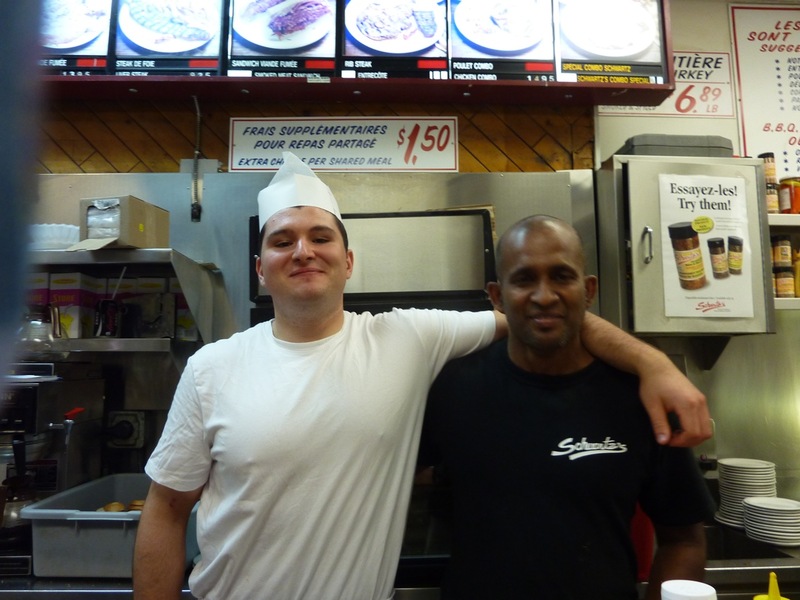 At the time (9 years ago) he was the chef at Joe Fortes Seafood and Chop House. After curing a number of briskets using both wet and dry cure methods he came to the conclusion that dry curing was best as it took only one week versus one month with the wet cure method. He also thought the end product was better as well. 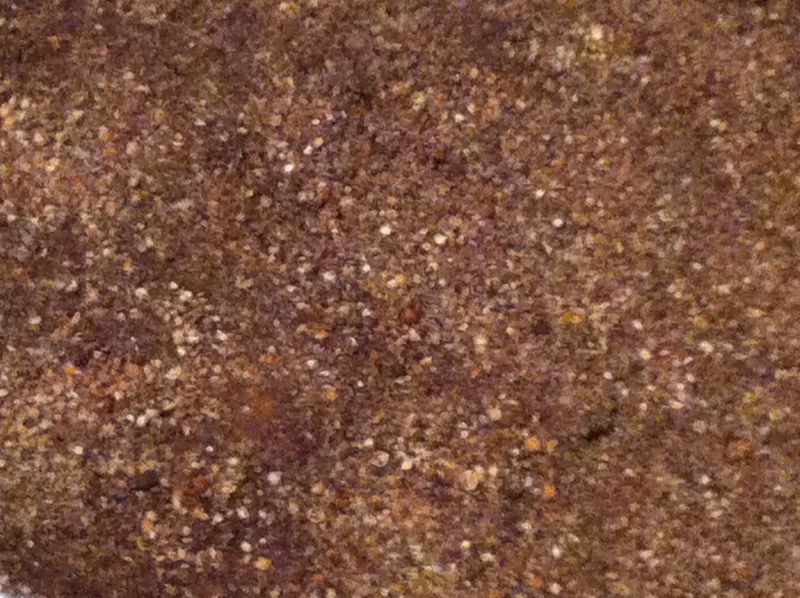 So I felt well prepared to move forward and proceeded to forage for my raw materials. I got my brisket from K&K Foodliner on Whyte Avenue and kept it for 2 weeks to wet age just as Chef Fowke had done in his experiment. 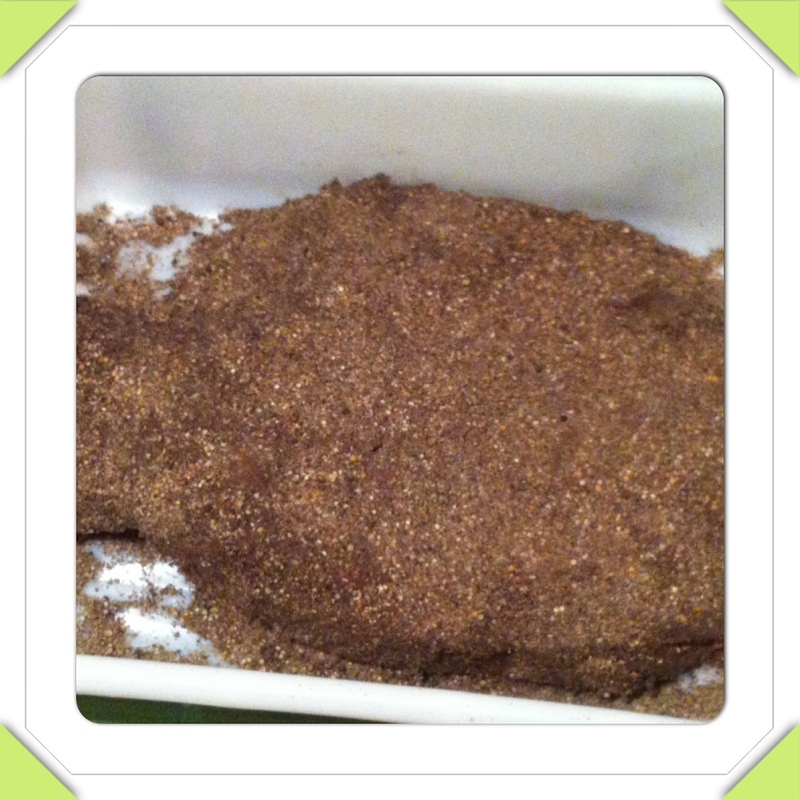 I then proceeded to use Porker’s recipe and coated the brisket in the cure. I wrapped the brisket in plastic wrap and placed it in a tub with a 12 pack of pop on top and placed it in the refrigerator. I flipped it every day for the first week or so and then every couple days for the last few days for a total of 12 days. I rinsed off the cure and soaked the brisket in cold water for 3 hours to remove some of the salt. Let me tell you this was now one ugly looking piece of meat (no photos taken) and my wife took one look at it and then at me and from the look on her face I thought well looks like me and the brisket are going to be having intimate dinners together for the next week, without my wife. I remember Chef Fowke writing that he almost threw away his first brisket because it was so ugly looking he thought he had ruined it but was unwilling to throw it away without cooking it first (it turned out to be wonderful). So I had hope. 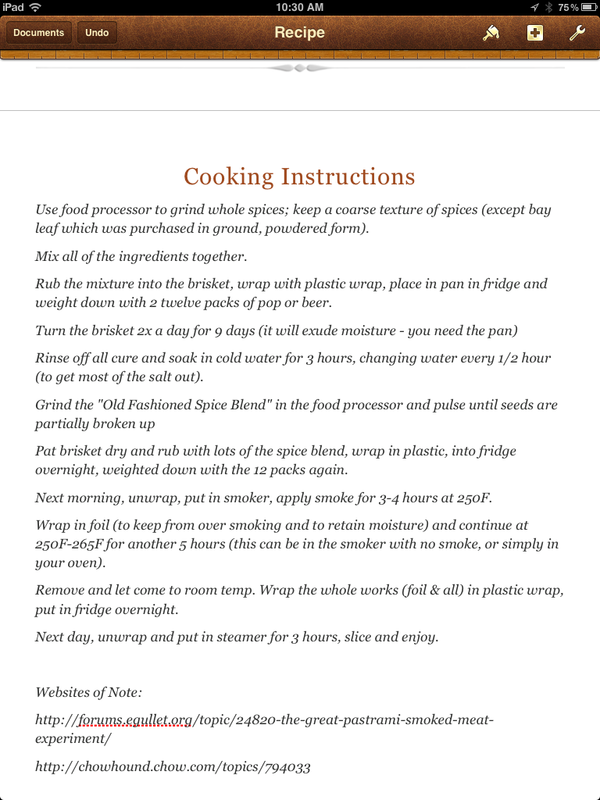 I coated the brisket with the spice blend of cracked peppercorns and coriander seeds and I wrapped up the brisket and put it back in the refrigerator overnight. I brought it out in the morning and placed it in the smoker for about 3.5 hours with apple wood smoke. 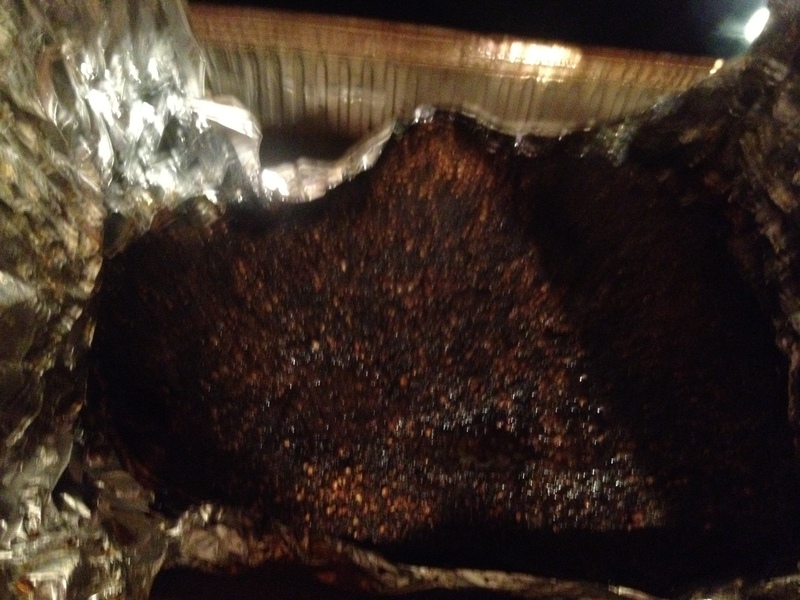 I then wrapped it with foil and placed it in a 250 deg F oven for another 4 hours. The house smelled amazing and my wife was starting to have second thoughts. I then let it cool to room temperature and placed it in the refrigerator overnight. The next afternoon I rigged a steamer using our roasting pan and proceeded to steam it for another 3 hours at 250 deg F. At this point when I brought it out of the oven it looked fabulous! I was nervous as I sliced it in half to check the colour. IT was an amazing reddish pink all the way through; nice and even and looked as good as any of the famous ones we had eaten. I sliced enough for our meal by hand with a chef’s knife and the four of us proceeded to dig in. It was a super hit and we feasted until bursting. The remaining brisket I cut up with my meat slicer and vacuum package it and froze it for future use (fingers crossed with this experiment). Two days later I took some leftover pieces in my lunch. If possible it tasted even better than the first evening. This great exploration was occurring at the height of the E-coli fiasco at XL Meats. My wife and kids were concerned about this ungainly piece of meat sitting in our refrigerator for about a month. The meat was not from XL but to their knowledge they had never eaten a piece of meat that had been in our refrigerator so long. (Note to self don’t waste money buying aged meats for them) Leftovers more than 3 days old start getting the squinty eyed look around here. Which means I get some pretty tasty lunches for work. The wonderful smells from the oven overpowered their fears by mealtime but I am sure they were watching their stomachs closely for the slightest sign of poisoning and I am sure my son was very relieved when he awoke the next morning, healthy and full of vigour. Oh, and an additional side note; a deli has opened in New York called Mile End Deli and according to their website they are “a Montreal inspired Jewish Deli in New York City that specializes in traditional Jewish comfort food made from scratch.” Both Zagat and New York Magazine have voted it best deli in New York. 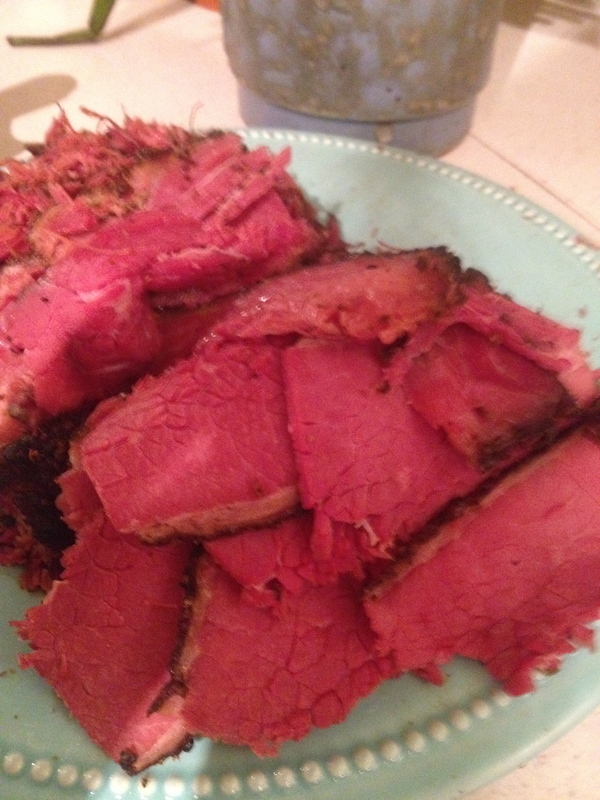 So there you have it, you can’t beat Montreal Smoked Meat; unless of course it’s Montreal Smoked Meat – Sailor Rick Style! ← Sailor Rick Does the Cheesepalooza with Petite Ungulates – AKA Sailor Rick Makes Feta.